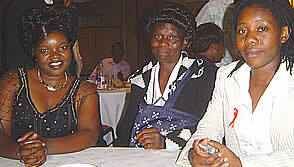 On Wednesday 30 November 2005, The Futures Group through its Zimbabwe AIDS Policy and Advocacy (ZAPA) project and USAID, honoured individuals and organisations that work for people infected and affected by HIV and AIDS. The awards ceremony, which is nationally recognized as the Auxillia Chimusoro Awards was established in 2000 by USAID. "The Chimusoro Awards are a series of awards that are in honour of a woman who was the first Zimbabwean to come out and reveal her positive HIV status. We, and USAID our donor, found this extremely courageous and the awards in her name are to honour other courageous individuals, organizations and those who are doing creative things in the fight against HIV/AIDS," said Dr Walkup, the Chief of Party for the Zimbabwe AIDS Policy and Advocacy Project (ZAPA). This year the winners in the media category are journalists Sarah Tikiwa and Bertha Shoko. Ms Tikiwa was applauded for her significant long-term contribution, commitment and sensitivity in writing about HIV related issues, while Ms Shoko was commended for her energy and critical analysis in covering the subject. In the workplace category, Hwange Colliery was honoured for its "significant contribution" in mitigating the HIV/AIDS crisis in its community by creating a comprehensive, effective and sustainable work-based HIV/AIDS policy and program. Orphanage founder Betty Saunyama was honored in the "vulnerable groups" category for her selfless support of children infected with, and affected by, HIV. Popularly known as Mbuya Saunyama, she runs an orphanage in Mbizo Township, Kwekwe. The "leadership" category was won by Dr Paul Chimedza, who was credited for his commitment and outstanding leadership skills in effectively responding to HIV/AIDS. Organizers also commended Dr Chimedza for demonstrating conviction in his work and increasing both the quality, and depth, of public discourse on the pandemic. In the same category Tendayi Westerhof, was applauded for displaying courage and encouraging frank discussions on related issues via her openness. She was named a role model for all Zimbabweans who are HIV positive. Past winners of the Auxillia Chimusoro Awards include journalist Andrew Mtandwa, Southern Africa AIDS Information Dissemination Service (SAFAIDS), popular musician Oliver Mtukudzi and the New Start Center.